Wine, of course, is mystically produced from fresh ripe fruit by microscopic fungi. People who love wine tend to love macroscopic fungi, too. For most casual mushroom lovers, once venturing beyond the safe confines of the supermarket produce department, there are several easily distinguished wild ones with a high safety profile. 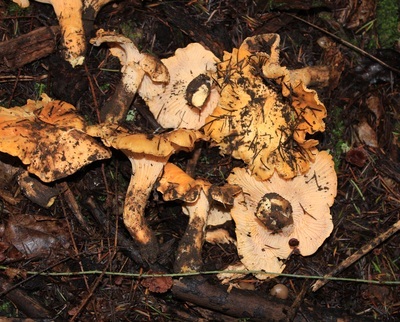 Foremost among these is our Chanterelle—showy, gorgeous, and distinctive. Close behind are oyster mushrooms (growing on dead oak), and morels (found in conifer forests, more common in the foothills than near the coast). Chanterelles have proven refractory to commercial cultivation, but you’ll sometimes find Chanterelles in upscale supermarkets in the winter, courtesy of experienced hunters. You’ll also find cultivated oysters and some exotic ones from reliable growers in farmers’ markets. Of course, there are dozens of other wild delectables—king boletes, matsutakes, and shaggy manes among the true prizes—but these require a keen eye and the ability to keep a secret. The location of secret sanctuaries can be passed within a family or among the closest of friends, but never published! Beyond the famous ones, there are hundreds of edibles. These require either an experienced mentor or tremendous discipline with guide books. David Arora’s definitive books have reached “biblical proportions.” (Mushrooms Demystified and All that the Rain Promises and More). Even heeding those qualifications, the willingness to bring these to the stove requires a certain philosophical tolerance of short term tummy woes. And then there are the deadly ones…fairly easy to identify for a sober, sentient, person with decent light and a love of life…but the operative word remains “deadly.” Amanita phalloides is fairly common around us. These sickly greenish white caps come up under oaks, but can be found anywhere. I just don’t pick any white or off-white mushrooms coming out of the ground. If Alice had eaten a phalloides in Wonderland, she wouldn’t have changed size. Her liver would have melted and she wouldn’t have survived to the end of the story. Let’s stick with Chanterelles. After you find these coffee-cup sized, orangy-yellow loving cups with wavy caps, white flesh, and corduroy gills that course down the stalk, take time to prance about the woods with anticipation. Then bring them to the kitchen without smashing them in your paper bag. Gently brush the grit and debris from among the gills (don’t rinse them), slice off the firm knob at the base of the stalk. Slice the mushrooms about ¼” thick. Sautee them with just a wee bit of olive oil. They’ll weep lots of juice, which we’ll treat like a treasure. The mushrooms will shrink a bit, but when “done,” they will be pliable but slightly firm, not mushy. Take them out and put them in a warm bowl. Then, to the treasured juice, add an equal volume of white wine and another equal volume of olive oil mixed with butter. Salamandre Chardonnay, needless to say, is the best choice…salamanders and mushrooms rule the same territory, after all! Reduce under low heat, stirring frequently, until it becomes viscous. The aroma has aphrodisiac qualities, so be careful next to the stove! Based upon your taste, you could simmer a judicious amount of thin sliced shallots with the reduction…optional…but don’t overdo it. Delicacy is the operative term for Chanterelles! Make some angel hair pasta. Linguini works nicely, too…but angels rule. Stir the mushrooms and the reduced sauce into the pasta. Add salt to taste …and that’s it. No other spices needed, not even pepper. Simple bliss is best. Enjoy with what’s left of the Chardonnay and contemplate your next venture! If you’re going to do this again, buy the Arora book.